Brooklyn-based electronic duo return with their fifth album. 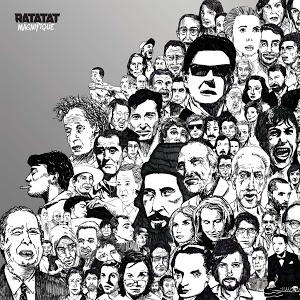 It is no surprise to learn that Ratatat have supported Bjork and Super Furry Animals – indeed, you could easily believe that this album was another of Gruff Rhys’ side projects, with its winningly eccentric flavour. The album is entirely instrumental and kicks off in superb style with a short ‘Intro’ followed by one of 2015’s best singles so far, the wonderful ‘Cream On Chrome’, which has already clocked up almost 2 million YouTube views. The track, like several others on this album, occupies that rarely (never?) explored territory between Daft Punk‘s ‘Da Funk’ and Mike Oldfield‘s ‘Tubular Bells’ and has a bass line that no doubt went down a storm at the band’s recent Coachella Festival headline slot. Magnifique was four years in the making and returns to their guitar-driven sound after the more experimental sound of their last two albums. The title track is a liltingly lovely Hawaiian-sounding treat, while elsewhere ‘Abrasive’ ups the tempo and sounds like another ready-made festival favourite. ‘Countach’ has a splendidly squelchy vintage synth-y bass line, while several tracks employ the unexpected feature of classic rock ‘twin’ guitars, in a Thin Lizzy vein, not least ‘Pricks Of Brightness’. ‘Supreme’ is a beautifully lazy sunny track that again utilises a Hawaiian vibe and begins a pleasing wind-down towards the end of the album. A pretty inessential ‘Outro’ finishes things off, and almost seems to be there purely because proceedings began with a track called ‘Intro’. Magnifique is a truly entertaining and, yes, fun album and does have a sound all of its own. Released on the 17th of July on Because.